What a wonderful day again with the Gumnuts school holiday program. It is so fantastic having the children out and they absolutely love it with the last comments being ‘this is the best day ever!’. This is the second time the school holiday program has attended and it is an amazing experience for both the children and the dogs and puppies. The children have a fantastic day looking at all our facilities and learning about the development of the dogs and puppies and why socialisation is really important. They spend time in the Early Socialisation Pen, the surface training area, the youth agility park, and also through our nurseries. They see the live in yards as well as the playgrounds. The puppies absolutely love the day and it is great for their development to see so many children over a 2 hour period. They are picked up and held and a few we saw even having massages! The dogs thrived in the attention and it is great to give them different experiences like this as it broadens their brains from a young age making them more confident dogs for their entire lives. The Gumnuts kids we must say always behave INCREDIBLY well and are a credit to their carers and parents for how they listen to instructions, information, and are keen to learn. They always treat the dogs and puppies with respect and care, and it’s a great thing to see in children. Our dogs and puppies were presented with a big box of 301 doggie biscuits cooked specially by some of the older girls including things like peanut butter and bacon which we all know are loved by the dogs. The dogs all gobbled up the biccies within a couple of days and we loved the presentation by the older girls. Here are some lovely photos of the day! Do you place being family friendly above ‘cuteness’? A survey of puppy buyers has found just that; that people want dogs which will be family friendly, low shedding and suited to their lifestyle, while ‘cuteness’ is of least importance to them. Banksia Park Puppies is one of Australia’s largest dog breeders and has been breeding dogs for more than 50 years. Banksia Park is situated on a 220 acre property near Sale in Gippsland where the climate and local environment is ideally suited to dog breeding. More than 1700 Banksia Park customers were surveyed over the past 18 months on their preferences when making a puppy purchase. 90 per cent of people surveyed said their decision was primarily based on the puppy being family friendly, followed by low shedding and whether the dog would suit their lifestyle. ‘Cuteness’ was the lowest rated factor, and it did not feature at all in 37 per cent of responses. 51 per cent of Banksia Park customers visited an animal shelter when looking for their puppy. However, they didn’t get a rescue dog due to the breed they wanted not being available or concerns about the temperament and suitability of the dogs available. Matt Hams, the owner of Banksia Park Puppies, said the survey results highlighted the amount of thought and effort that many people put into making a puppy purchase. ‘People really care about the kind of the puppy they are getting and its background, including its health and temperament,’ Mr Hams said. ‘For families in particular, choosing the right type of puppy is essential to make sure it is suitable for their lifestyle and home environment. ‘We put a lot of care and attention into the health and socialisation of our puppies to help their transition into a family environment, for the benefit of the dog and its owners,’ Mr Hams said. The survey also found puppy buyers placed a high priority on getting the type of dog they wanted, followed by a health guarantee. Purchasers also wanted to get their puppy from a reputable and experienced breeder, including those who were full-time breeders. For three-quarters of those surveyed, price was their lowest priority. Mr Hams said the survey highlighted the important role of professional breeders in meeting the demand from customers for healthy, happy and well-socialised puppies that become much loved and valued members of Australian households. These accessories have a pattern which is unique to Banksia Park Puppies. Why? So that if we see a dog out and about with one of these products then we will be able to stop and say hi! Also so that if you see another dog in the dog park with one of these accessories you know you can walk over and introduce yourself and see who the parents are and if you have a sibling or even a cousin. Here are some of our gorgeous dogs in the new accessories. See here for information on purchasing. Tobasco modelling Barkey Blue in the car! 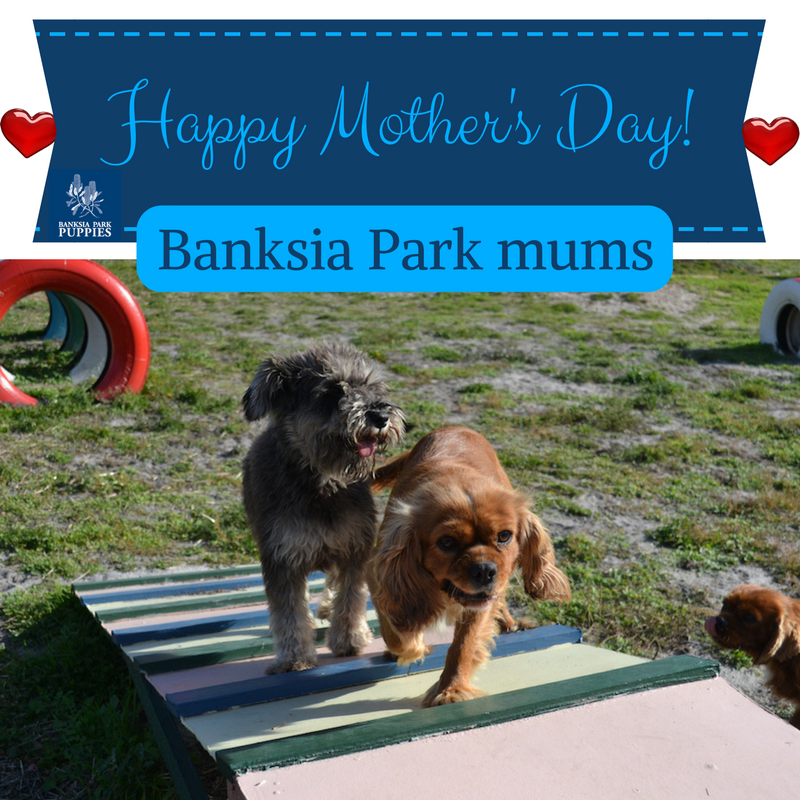 Our future Banksia Park Puppies mums! Where did the mum of your puppy grow up? What interaction did she have with our socialisation and play staff? Where did she play? When she was 10 weeks old where was she? 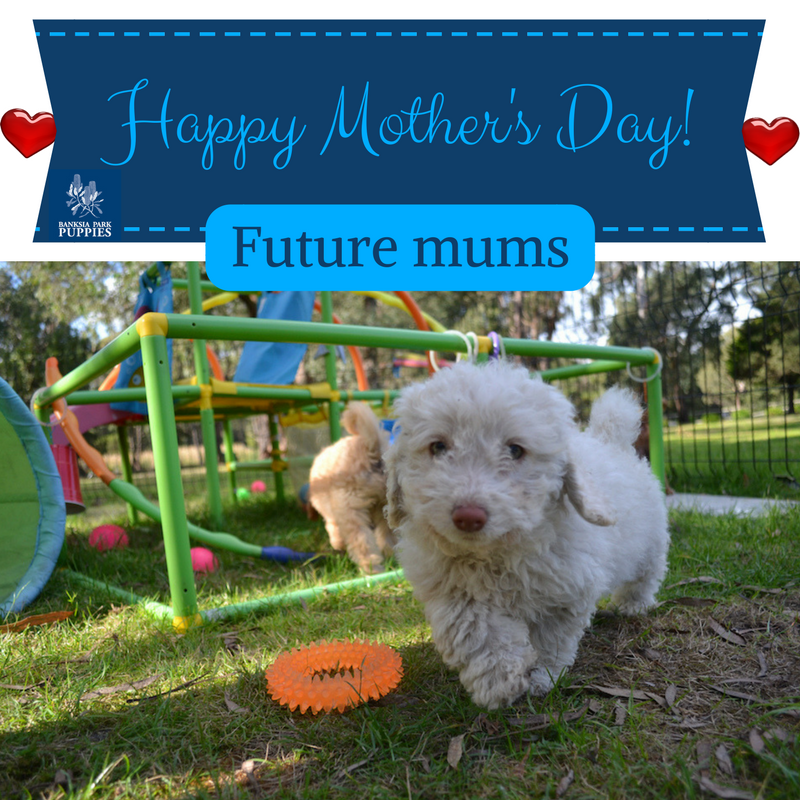 These are all questions which we go through on a customer tour of Banksia Park Puppies, so this special Mother’s Day post is for all of our future mums! Why did we choose her as a future mum? Our Banksia Park Puppies mums are chosen to breed here at Banksia Park because they have the healthiest and best temperament in their mums, and she is healthy herself. We look at her mum and dad and pick the healthiest parents for her, and then she is also checked incredibly closely by our Vet to make sure she is also healthy and strong. Where was your puppy’s mum as a puppy? After 8 weeks when her siblings have left to go to their new families, our young future mums spend their days in our ‘Early Socialisation Pen’ – we call it our ESP. There are three of these. They have dedicated socialisation staff to make sure they are growing and learning every day, and therefore will grow into confident, happy, healthy adult dogs. Our ESPs are set in the middle of the property where they see the most people, the most machinery, the most cars, and the most kids and visitors to ensure they are top of mind and always getting a play and a pat. Here are some photos of our current puppies in our ESP. How did your puppy’s mum receive enrichment? When our puppies are between 8-12 weeks they start to play in our surface training area where they spend lots and lots of time playing with us, our socialisation staff, and on/with different surfaces. This helps them become confident dogs with the ability to settle into different experiences and places. This is incredibly important for our puppies as they will be rehomed at 4-5 years old and need to be able to assimilate into new environments – often into city homes from a country environment! Here are some photos of our puppies playing with our socialisation staff in our surface training area. Where did your puppy’s mum spend her youth? I know where the playground is! Happy Mother’s day to all our future mums here at Banksia Park! Who knows Taylee? 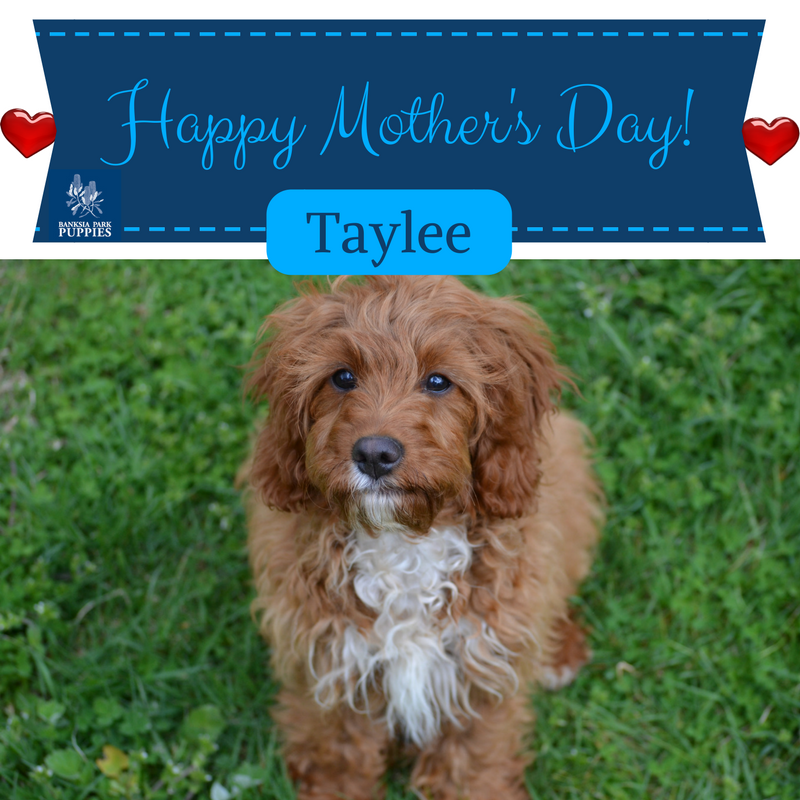 She is one of our much loved cavoodle mums here at Banksia Park Puppies. We are very sad but happy to say that our beloved Taylee will be going to her new home in the next couple of weeks. She has been very much loved by us. She is leaving us earlier than our other mums to go to her new home. A family came to us to rehome one of our dogs as a therapy type dog, and we just knew Taylee would be perfect for their family. They have a boy who needs extra care and attention, and therefore they need a dog who will walk with them easily, be gentle, caring, and understanding with him, but also be a companion and a teacher. They need a very special dog, and so Taylee will be rehomed to this lovely family. As our fourth Mother’s Day tribute, and with a tear in our eye, we are going to miss you Taylee. Here is a little trip down memory lane of our time with the lovely Taylee. Taylee is obviously happy about her new haircut, running with her friend Ayasha. Hi Taylee! So happy to see us all the time!